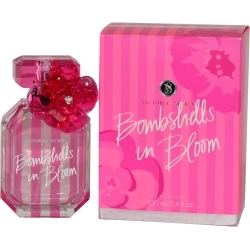 Make yourself unforgettable with Bombshells in Bloom, an ultra-feminine scent from the fragrance design house of Victoria's Secret, released to the public in 2014. Designed for women, this scent lets you unleash your inner bombshell with its scintillating notes of pink freesia, romantically reminiscent of fresh-cut flowers. Subtle yet sweet, fragrant water lily notes surround you, pairing perfectly with the refreshing yet familiar fragrance of red apple. Choose Bombshells in Bloom for a night of dinner and dancing.